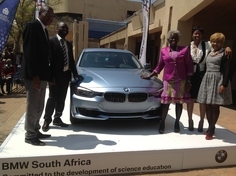 On Wednesday, 18 September 2013 the Science Centre of the North-West University’s Mafikeng Campus was presented with a BMW Educational Display Car by the Deputy Minister of Science and Technology, Honourable Advocate Michael Masutha. This is the fourth BMW 3 series display car that the Department of Science and Technology (DST) and BMW South Africa have donated to selected science centres in the country. According to the Deputy Minister, the donation emphasises the commitment by the three parties [NWU, DST and BMW South Africa] to enhance young people’s access to science, maths, engineering and technology in the country. “As custodians of science and technology in the country we really take pride in such initiatives which seek to encourage learners to gain more interest in science”- said Hon. Masutha at an event which was also attended by over fifty learners from local schools. Ms Esther Langa from BMW South Africa said the Educational Display Cars were built in the pre-production stage of the new BMW 3 Series in early 2012 and as pre-production vehicles, they are not allowed to be registered and would have been scrapped. “That is where our partnership with the department started. We decided that instead of scrapping these cars, we rather donate them to science centres across the country for educational purposes”, explained Ms Langa, Corporate Affairs Manager at BMW South Africa. “The vehicle boasts various technologies, which are all inspired by science, research and innovation and we hope it will inspire learners to excel in their studies”, she added. In his vote of thanks, after receiving the keys to the car, Campus Rector Prof Dan Kgwadi said, echoing his vice’s words that the campus has and will always do anything within its powers to demystify science. “We want to be seen as a bridge between science and young people especially those in rural areas. To that effect, we will always be humble to government as well industry for their support”, said Prof Kgwadi. Afterwards, all dignitaries were taken on a tour of the science centre. Although the centre only opened its doors in August 2010, it has so far hosted over 29 000 visitors, majority of whom have been learners from local schools. The centre also hosts workshops regularly to expose educators to new and exciting methods of teaching and demonstrating science in the classroom. Learners are also hosted in extra-curricular sessions, providing enrichment of content and career guidance.